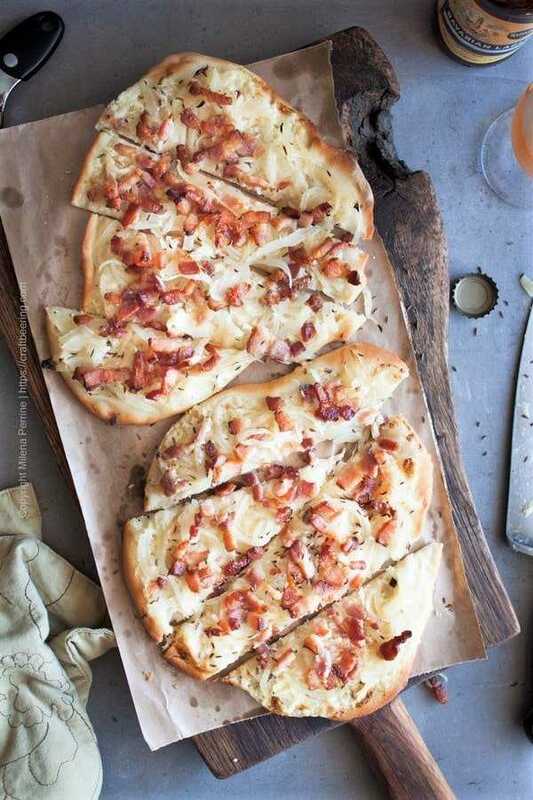 Traditional Tarte Flambée, also known as Flammkuchen is a thin tart topped with creme fraiche, thinly sliced onions and smoked bacon. It is baked in a wood-fired oven. This recipe is calibrated to help you bake a delicious Tarte Flambee at home. Many regard Tarte Flambée as the pizza dish of the Alsace region of France and the adjacent Rheinland and Baden-Württemberg regions of Germany. It originated as just a layer of bread dough, rolled out very thin and baked for a minute or two in the intense heat of a wood-fired oven. Tarte Flambée translates to a ‘tart/pie baked in flames’ from French. Its German name, Flammkuchen (sometimes Flammekueche), translates to precisely the same – flamme=flame and kuchen=tart. The two names are used interchangeably given the history, shared traditions and frequently bilingual population of the area. Refer to the Tarte Flambée and Flammkuchen Historical Background section at the bottom of this post for details. Make the Dough – Yeast or No Yeast? 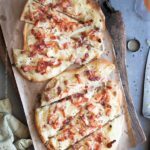 As can be expected when a traditional regional dish is concerned there are many, many recipes for the Tarte Flambée dough as well as variations of the toppings. Traditionally half rye flour and half wheat flour were used and no yeast was added. At the time bread dough was mixed and proofed in large, bacteria rich dough wooden bowls. The micro flora inhabiting the wood fermented the dough. 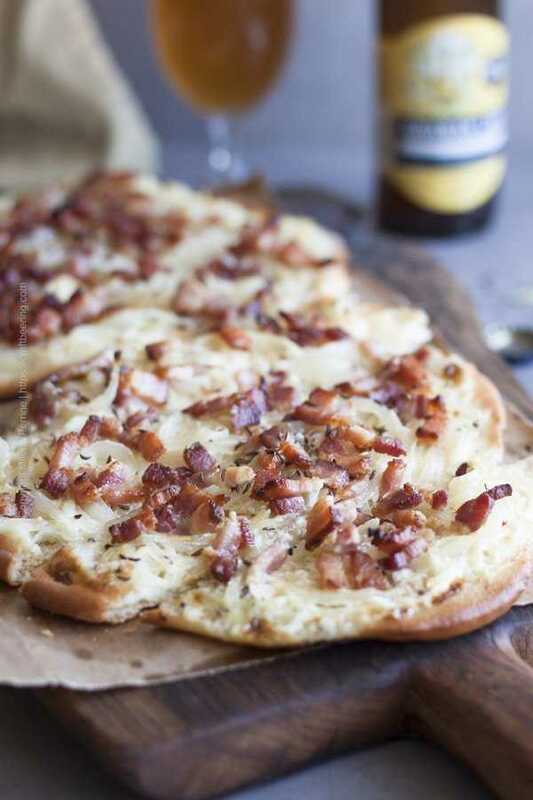 Many original recipes for Tarte Flambée and Flammkuchen do not call for yeast or call for home brewed beer (with live yeast). Nowadays however, the dough is frequently leavened with yeast – both in commercial establishments and in home conditions. Another reason in support of adding yeast is the baking temperature for Flammkuchen. Unless it is baked fast by the intense heat of a wood-fired oven it can dry out excessively over prolonged time in a regular oven and fail to form its landmark crisp-chewy crust. We recommend that you use a little bit of yeast and proof the dough. 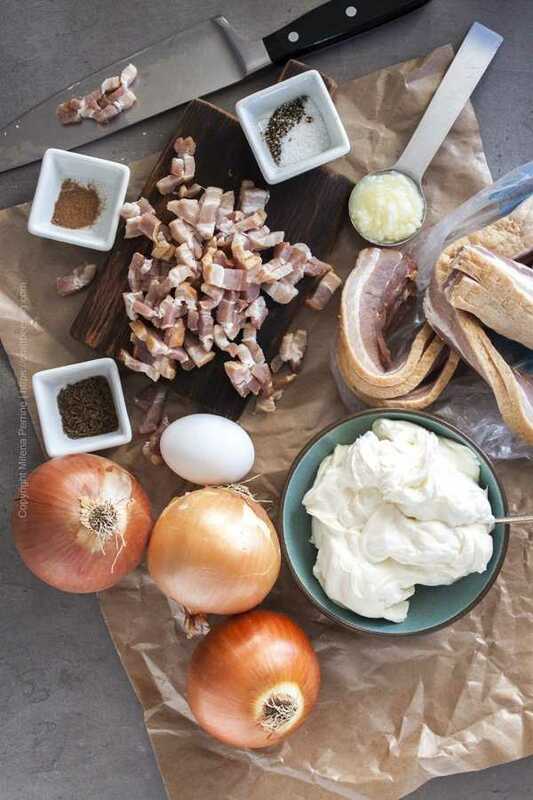 Ingredients: The core ingredients for the traditional Tarte Flambée topping are lean smoked bacon, onions, creme fraiche, nutmeg, salt and pepper. Often times an egg yolk is added to the creme fraiche and in Alsace fromage blanc. The bacon is sometimes pre-cooked in clarified butter. 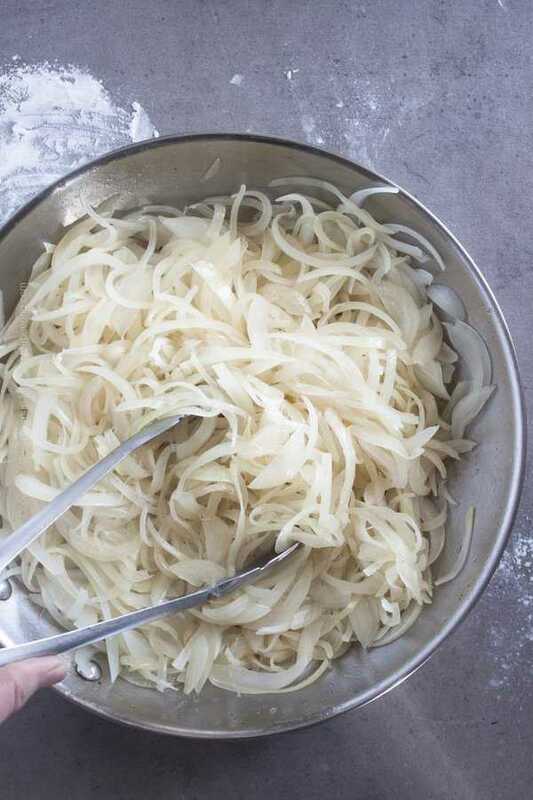 Caraway seeds are typically sprinkled over the Flammkuchen in Germany. 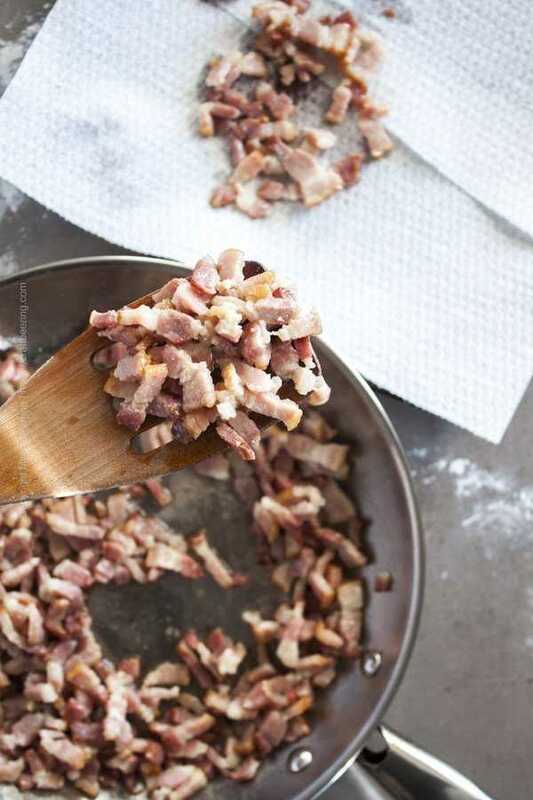 Process: Begin by cutting the smoked bacon into small lardons (cubes or strips) and cook it in a tablespoon of clarified butter (or cooking oil) until it starts to get crisp. Transfer to paper towel lined plate. We recommend that you do this because uncooked smoked bacon will not get crispy enough in a regular oven. In the grease left from the bacon soften the thinly sliced onions. They do not need to become caramelized, only soft and translucent. Next mix the creme fraiche with an egg yolk, nutmeg and salt and pepper. You can use either one but traditionally it is creme fraiche. Sour cream has less fat and tastes more sour than creme fraiche. TIP: If you want to make your own creme fraiche place two cups of heavy cream in a container, add four tablespoons of buttermilk to it, stir, cover and let sit in a warm place overnight. Refrigerate the next day. 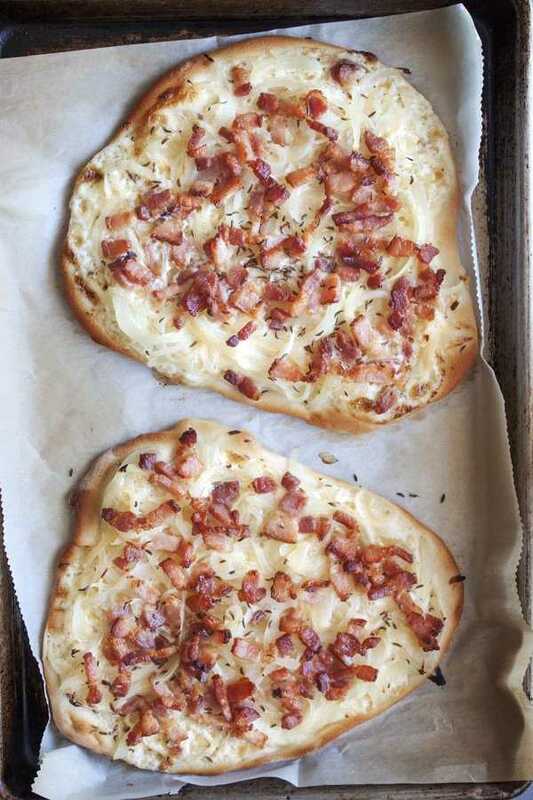 Tarte Flambée Shape – Round or Square? Once you have all the toppings ready roll out the dough. You can do so in large or small, round or square/rectangular shapes. As long as it is thin. If you visit the regions where Flammkuchen is traditional you will see it presented both round and square. When we lived in Schwarzwald and traveled around the vicinity we noticed that on the same restaurant dotted pedestrian street in Freiburg or Strasbourg you can be served either version, depending on where you happen to sit down. Smaller, free-form-shaped Flammkuchen are quite common on German beer garden menus and we rather favor those. Great snack food to enjoy with German lagers. Home oven baked tarte flambee. Roll out the dough really thin and place it on parchment paper lined baking sheet. Apply the white ‘sauce’ you prepared earlier with a spoon. If you’d like to add fromage blanc (or grated Gruyere or Emmenthal) do it now. Next place a layer of onions, top with lardons and sprinkle with caraway seeds. Bake until the edges of the dough begin to darken. Serve right away. See below for traditional beer and wine pairings. 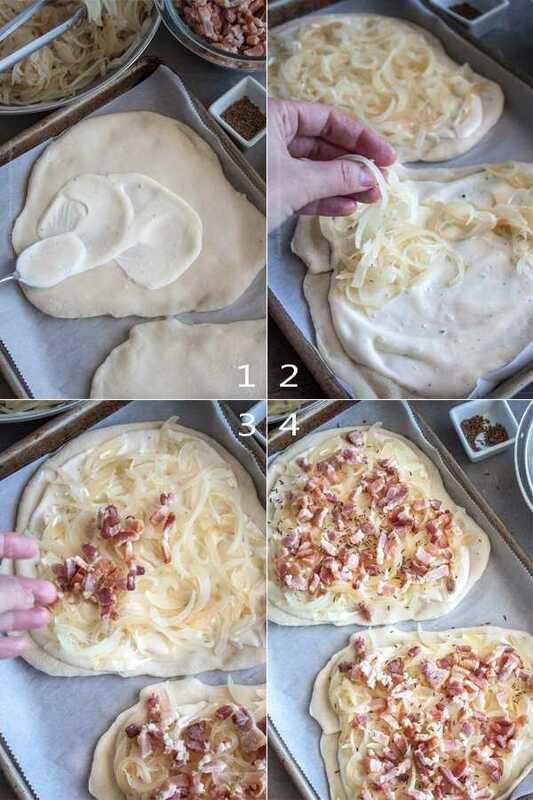 Tarte Flambée is a thin flatbread topped with creme fraiche, thinly sliced onions and smoked bacon lardons. Traditionally it is baked at extremely high temperatures in wood-fired ovens. This recipe is designed for baking in a home oven. Sift the flour. Combine the yeast, sugar and water in a bowl and let the yeast activate. Add the flour, salt and oil and mix until a dough forms. If using a stand-up mixer, let it work on the dough for a couple of minutes. If kneading by hand, knead actively onto a floured surface for 5 minutes. Cover the dough and let rest in a warm spot for about 1 hour. In the meantime cut the bacon into small, thin strips and thinly slice the onions. Heat the clarified butter or cooking oil over medium heat and cook the bacon until it just begins to get crispy. Move it to drain over a paper towel. In the same pan with the grease left from the bacon, saute the onions. When translucent move away from the heat and let them cool off. Mix the creme fraiche or sour cream with the yolk, salt and pepper, nutmeg. Knead the dough for a minute and divide it into portions (8 for appetizer sized or 4 for bigger flammkuchen). Roll out the dough pieces thinly and place then onto parchment paper lined baking sheets. Spread creme fraiche mixture over each tart, top with onions, bacon and sprinkle with caraway seeds. Bake for 20 minutes or until the edges begin to darken. This recipe yields 4 large individual tarts or 8 smaller appetizer-sized ones. We like making the smaller ones because they seem to bake more evenly in a home oven. One serving is 2 small or 1 large tart. If you are short on time feel free to use store bought pizza dough. Bring it to room temperature and roll it out thin as per the recipe. *If you'd rather not use yeast, also omit the sugar. Combine the sifted flour, salt and 3 tbsp oil (instead of 1) together and slowly add the warm water (most likely will only need 3/4 cup). Mix by hand or use a mixer. Move to floured surface, knead until the dough is elastic and let it rest covered for about an hour. Tarte flambee is traditionally eaten by hand. People commonly roll up large slices and eat them end to end. Being a flatbread at its core today Tarte Flambée is prepared with a variety of toppings beyond the traditional combination. There are even dessert options. 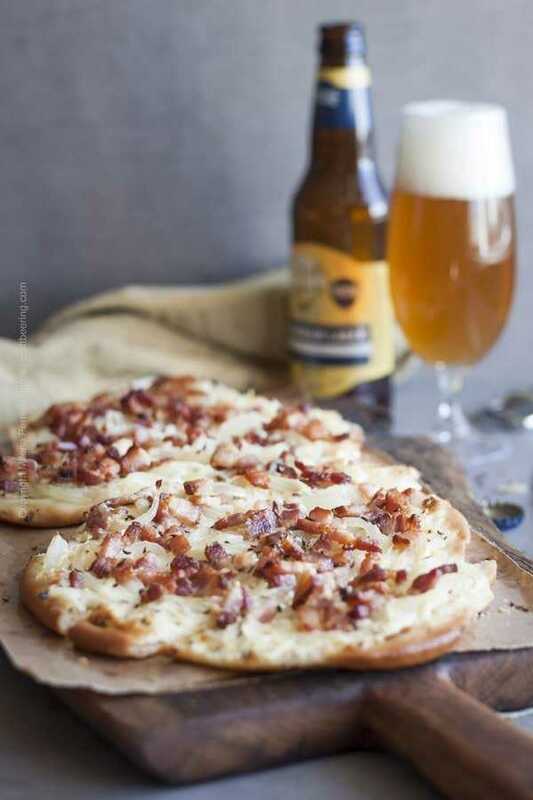 For a suitable beer pairing with your Tarte Flambée look no further than the crisp lagers popular in both Alsace and Southwest Germany, including the dark Dunkel and Schwarzbier. A refreshing Bavarian wheat ale makes a great contender. Wine aficionados can delight in pairing Flammkuchen with the regional white wines of Alsace and the Rheineland such as dry Rieslings, Pinto Blanc (Weissburgunder), Pinto Gris and even Gewurtztraminer. Alsace, today in France, is a rich region with a complicated, turbulent history. In the past there were numerous periods when it was ruled by the predecessors of contemporary Germany. In result German is still spoken there today, as well as several other dialects influenced by both French and German. Alsace shares a lot of cultural, including culinary traditions with today’s Rheinland and Baden-Württemberg (previously Baden, Palatinate) regions of Germany. Back in the day bread was baked once or twice a week in large, wood-fired communal ovens. 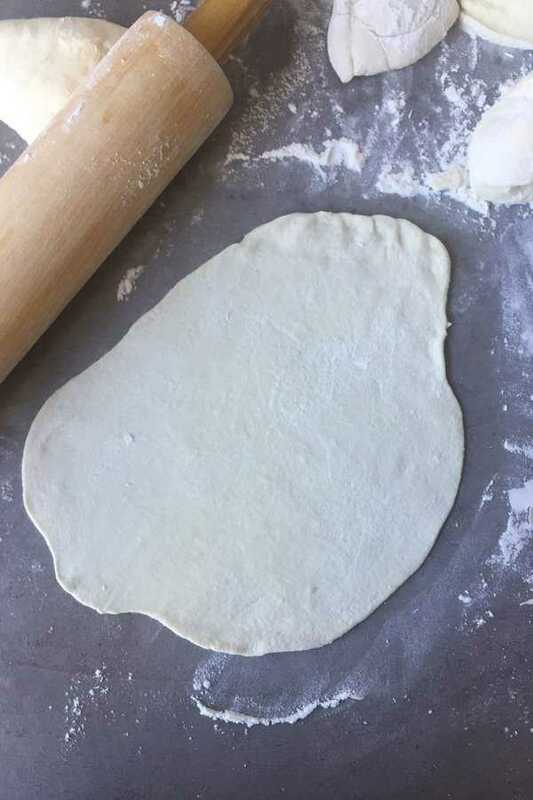 To test if the temperature is high enough for bread baking, a thinly rolled flatbread would be inserted in the center of the oven, the embers pushed to the side. The intense heat would bake it in matter of a couple of minutes. The crust on the periphery of the flatbread would frequently get burned by the flames, hence the names – Tarte Flambée/Flammkuchen. Subsequently people started adding toppings to the thin test breads and creme fraiche, onions and lardons became popular in Alsace. Saving this recipe. Tasted just like the ones I remember from our trip to France. Will be making it again. Thank you for sharing how to make the creme fraiche. Flavors to write home about!! There’s nothing here that I don’t love!! Thanks for sharing! Gosh, I always learn so much from your guys. I’ve not heard of this recipe before, but can already see it will be a winner in our household!! Thank you for sharing at Create, Bake, Grow & Gather this week. I’m delighted to be featuring this recipe at tonight’s party and pinning too. My kids recently have a thing for onion and homemade pizza. This, I think will definitely go down well with them, not just because of the onion, but the bacon, the cream fraiche. 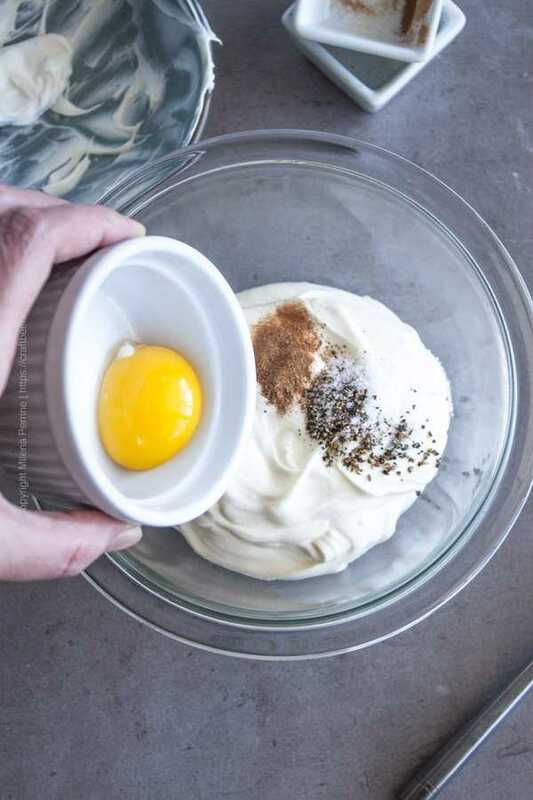 Love that you share how to make our own cream fraiche because it’s not always easy to find it, at least where I am. Love how easy it is to make too. I agree on the yeast, I like somehow like a yeasted dough 🙂 that texture is just different. ‘Tart pie baked in flames’, huh? I’ve never heard of this before, but now that I know about it, I HAVE to try! Sounds absolutely delicious! Love the idea of asparagus on there too. Pinned! I’ve never heard of flammkuchen but I love anything that involves bread dough :). And I love the option of topping it with caraway seeds–soooo good! Have a great weekend! Thank you, Kelsie! We are also huge fans of caraways seeds.